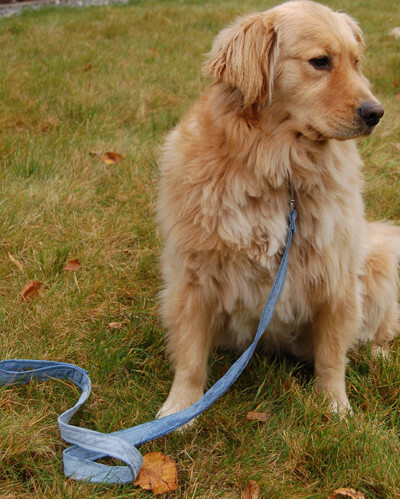 How to make a dog leash out of Jeans. 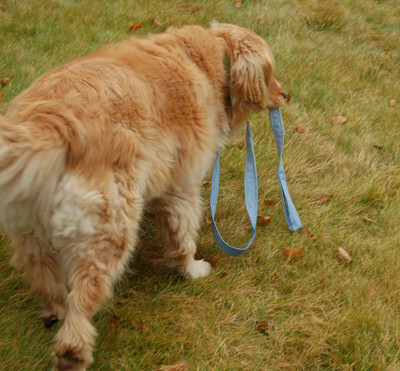 This is a quick and cheap way to make a good quality dog leash. 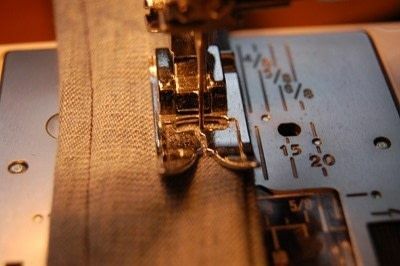 As long as you make it with a sewing machine, instead of hand sewing, it should be just as strong as a store bought leash. Just be careful not to wash it in a washing machine because that may damage the latch and it wouldn't be safe to use anymore. 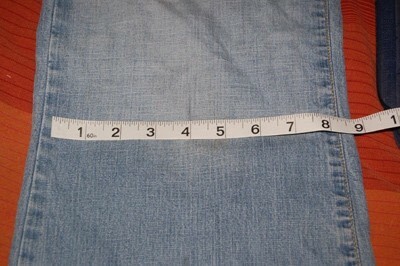 Measure out four inches at the narrowest part of your jeans. Each pair of jeans usually makes four leashes. 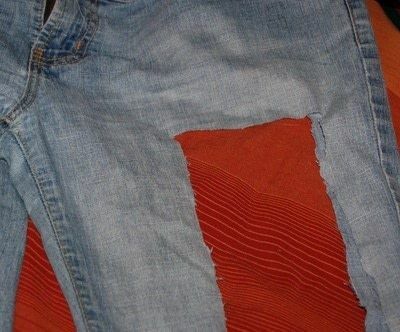 Cut right through the jean to the other side of the leg so you have two strips. 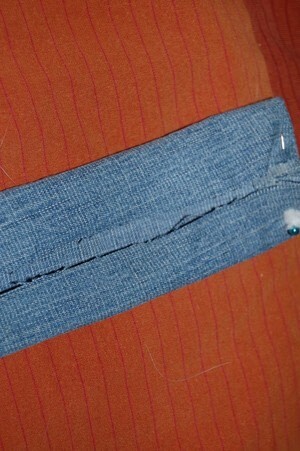 Fold the raw ends of the strip over onto the wrong side. Also fold in the two sides till they meet in the middle. Pin to hold in place. 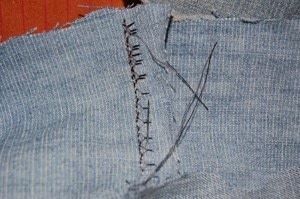 Fold the strip in half so the sides and top are inside and pin down the middle. 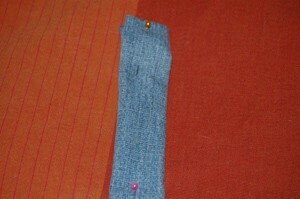 Sew two seams down both sides of the strip in any colour thread you like. They should be about 1/4" away from the sides. 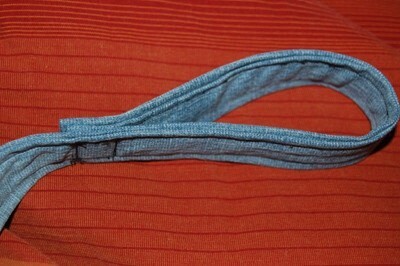 Fold the top of the strip over to create a handle and sew securely in place. I tried to do a double fold like most of the store bought leashes I own, but it was too thick for my sewing machine. 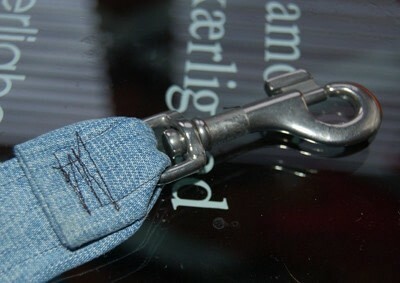 Fold the other end through the latch and sew it securely in place. In this picture I used a half-an-inch latch because it was what I had, but I recommend a one inch latch because it will be stronger. I love the way the doggie carries the leash in his mouth~!!! this is awesome!! looks really sturdy, too!! great job! great idea! That would be very strong. Your doggie is so photogenic!